It is this formula that JunkAway lives by, and our innovative concept has filled a void in the marketplace. We haul junk! 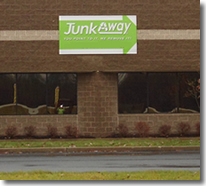 JunkAway is the affordable alternative to the do-it-yourself junk removal approach. Our professionals do the heavy lifting so consumers don’t have to. You point to it, we remove it! JunkAway’s mission is to provide the customer with a junk removal and hauling service in an environmentally sound, completely trustworthy, and professional manner. We exist to attract and maintain customers. Our goal is always to leave customers happier than when we arrived. The junk removal service industry is fairly new. There are just a few franchised companies that offer this service. Along with our competitive franchise fees, extensive training and ?turn-key operations, our vision for all JunkAway franchises is to provide the customer with a junk removal and hauling service in a caring, compassionate, and professional manner. Our systems are designed to be ?green without sacrificing profitability. Often, individuals do not know what to do with many large household items—that’s where we come in. Anything from appliances to wood or plain old rubbish, we haul it all. Customers enjoy our all-encompassing approach. JunkAway intends to be the best in class regarding customer service. Each job is handled with the customer’s wishes in mind—many of whom are dealing with emotional issues regarding the items they are getting rid of. Be it the passing of a loved one or disposing of items that are memorable, all items are removed and placed on the truck with care and respect. Respect, cleanliness and timeliness go a long way. Our calling center procedures have been unmatched in the marketplace. We gain credibility and professionalism from the first "hello". JunkAway is poised to cover the national market while still offering the hometown quality that customers expect and deserve. We have a regional focus and understand the importance of the local community, and recognize the value of neighboring relationships. We have established a standard of operations to enable each location to adjust to the desires of the community served. Doug and Paula Lewis started JunkAway after researching the junk removal industry as well as other business opportunities for a long time. It was important to them to have a business that could be compatible with their family life while supporting them financially. In addition, it was vital the business would allow them to achieve their charitable ambitions. They discovered that junk removal was definitely under-served and in need of a caring, professional company. It was clear early on that customers have strong attachments to their "things" and they needed a company that could be sensitive to that. They also realized quickly that growth for their company would be best served through franchising. Partnering with like-minded business owners and bringing their expertise to someone else's dream of business ownership was clearly the way to go for them. They recognized that franchisees have the same drive and ownership in the business gives them more commitment. At JunkAway, we provide you the process you need to be successful, the tools to get started, and the programs to make the business function well. You will come to our office for your initial training and then we will be on-site to help keep things moving forward. Unlike people who open their own businesses independently, you have our team as a support system to answer questions, help solve problems and mentor you as a new business owner. We have partnerships with everyone from marketers to graphic designers to shirt providers to truck manufacturers so you don't have to negotiate with individual vendors. Most of all you will be part of a community of people committed to helping people declutter their lives while contributing to others. There is a great satisfaction in knowing the majority of the items you collect will not be wasted. Ready to be part of the family? Request information today!